WASHINGTON, Feb. 9, 2010 — Not­ing signs that the new strat­e­gy in Afghanistan “is begin­ning to bear fruit,” Defense Sec­re­tary Robert M. Gates also said dur­ing an inter­view aired last night that the effort to build up Iraq’s secu­ri­ty forces and move for­ward with the U.S. draw­down plan there remains on track. Defense Sec­re­tary Robert M. Gates is inter­viewed by Gre­ta Van Sus­teren, host of the Fox News pro­gram “On the Record with Gre­ta Van Sus­teren,” in Rome, Feb. 7, 2010. Gates spoke with Fox News Channel’s Gre­ta Van Sus­teren while vis­it­ing Rome, also address­ing issues rang­ing from the Pak­istani military’s oper­a­tions in South Waziris­tan to Iran’s ura­ni­um enrich­ment activ­i­ties. The sec­re­tary not­ed signs of a pos­si­ble turn­around in Afghanistan, as expressed last week at the NATO Min­is­te­r­i­al in Istan­bul by Army Gen. Stan­ley McChrys­tal, the top U.S. and NATO com­man­der on the ground. “He thought the sit­u­a­tion was still seri­ous, but no longer dete­ri­o­rat­ing,” Gates said. “I think we are begin­ning to see the impact of the Marines going into Hel­mand province. 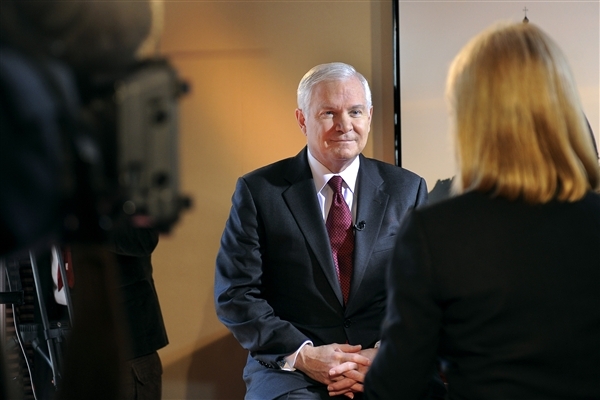 We are begin­ning to see the impact of increased forces in oth­er places,” Gates said. “I think part of what many of us are feel­ing is that there’s an intan­gi­ble increase in con­fi­dence and hope, both on the part of the Afghans, but also on the part of the nations that are with us in there, try­ing to help. “There are some small signs that the strat­e­gy that Gen­er­al McChrys­tal is fol­low­ing is begin­ning to bear fruit,” he added. But Gates empha­sized that the fight is far from over. “It is still going to be a hard fight. There’s some very hard days ahead,” he said. The new strat­e­gy mea­sures suc­cess, not in how many Tal­iban are killed, but by how many Afghans are pro­tect­ed, the sec­re­tary not­ed. As the Taliban’s momen­tum begins to reverse, Gates said he expects more low­er-lev­el mil­i­tants to put down their weapons and rejoin Afghan soci­ety through Pres­i­dent Hamid Karzai’s rein­te­gra­tion effort. Gates said he’s see­ing ini­tial indi­ca­tions that rein­te­gra­tion is work­ing. Turn­ing to Iraq, Gates said Army Gen. Ray­mond Odier­no, the top U.S. com­man­der there, is “pret­ty com­fort­able” with the arrange­ments made to ensure a respon­si­ble draw­down of U.S. forces. “The Iraqi secu­ri­ty forces have con­tin­ued to improve. We will con­tin­ue that train­ing role with them through 2011. We’ll con­tin­ue to do coun­tert­er­ror­ism oper­a­tions with them,” Gates said. “But we are pret­ty much on sched­ule” with the draw­down plan. Mean­while, he said he’s reas­sured that the polit­i­cal process in Iraq, which, although not pro­gress­ing as smooth­ly as hoped, is pro­ceed­ing demo­c­ra­t­i­cal­ly. “When it comes to pol­i­tics in Bagh­dad, real­i­ty is, these guys are try­ing to solve their prob­lems polit­i­cal­ly rather than with guns,” he said. Regard­ing Pak­istan, Gates acknowl­edged the strong offen­sive the Pak­istani mil­i­tary is con­duct­ing in South Waziris­tan and else­where around the coun­try – one he said is exceed­ing all expec­ta­tions. “If you had told me 18 months or two years ago that the Pak­istani army would be oper­at­ing in South Waziris­tan, that they would have gone in the Bajaur Agency [with­in the Fed­er­al­ly Admin­is­tered Trib­al Areas], that they had gone into Swat [Val­ley], I would have thought that would have been a mir­a­cle,” he said. He reit­er­at­ed the mes­sage he deliv­ered while vis­it­ing Islam­abad last month. “We are in this car togeth­er, but we rec­og­nize on your side of the bor­der [with Afghanistan], you are in the driver’s seat and you’ve got your foot on the accel­er­a­tor,” he said. Gates expressed con­cern about Iran­ian Pres­i­dent Mah­moud Ahmadinejad’s defi­ance of the inter­na­tion­al com­mu­ni­ty in mov­ing for­ward with nuclear enrich­ment. The Unit­ed States and the inter­na­tion­al com­mu­ni­ty have giv­en Iran ample oppor­tu­ni­ty to pro­vide reas­sur­ances of its inten­tions, and that it will stop vio­lat­ing the Nuclear Non-Pro­lif­er­a­tion Treaty and U.N. res­o­lu­tions, he said. More of Van Sustern’s inter­view with Gates is sched­uled to run tonight, with the focus expect­ed to be on a pos­si­ble over­turn of the “Don’t Ask, Don’t Tell” pol­i­cy that bans gays from serv­ing in the mil­i­tary.